Want to set up your first home recording studio? Discover the 7 recording essentials you need and learn the entire step by step process from the beginning. Are you just getting started with your first home recording studio setup? Maybe you are feeling a bit overwhelmed and confused? Good news … you are in the right place! 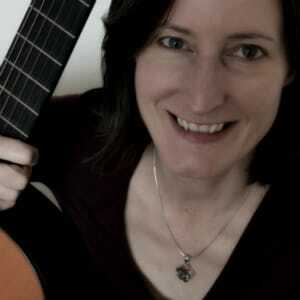 At Music Repo we have years of experience in helping people get started. 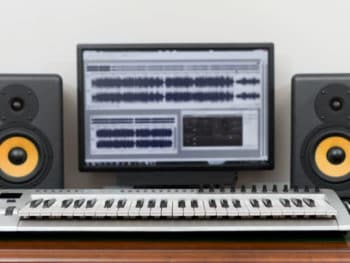 In this post, we explain the key components of a music recording studio for beginners so then you are all setup to make real progress with your recordings. Our mission in life is to guide you step by step and make the learning process as simple as possible so that you succeed and make the most of your home recording studio, even if you are a complete beginner. Audio recording is a fun, exciting and rewarding activity. And today’s affordable technology means that anyone can have in their home the tools they need to professional sounding recordings. Gone are the days when this was only possible in a multi-million pound studio. But the problem is that simply buying the tools alone is not enough to do the job. It is essential that you also learn how to setup and use them properly and there is a learning curve. It is a sad fact that too many people get stuck, become frustrated and never achieve their recording goals. We want to help you succeed! So we take a very simple approach here. Start of with the right home recording studio kit – you only need a few basic items to get going. Then we give the help and advice you need to get it setup correctly. There are 7 main components that should be on any beginner’s home recording studio list. These are the key essentials needed to make good quality recordings at home. But you don’t need them all at once! You can build up step by step and what you choose to buy for your own home studio recording will depend on what you want to achieve. It may be you can achieve everything you want with a simple USB mic and a set of headphones if you just want to record vocal tracks. Or just a MIDI controller if you are only interested in creating sheet music or learning to play the keyboard or piano. So pick the items YOU need. But to help you get started here are our top 7 items for the complete newbie. We will look briefly at each item in turn and carefully explain in plain english exactly what it is, how it works, how to choose the best equipment for you, how to set it up and troubleshoot any problems. Once you have got the basics in place, then we have step-by-step guides on how to use each component to record yourself, edit, mix and master your tracks, to create your own music, or use it to learn how to play an instrument better. The same techniques will apply whether you are a musician wanting to record your songs or backing tracks, whether you are a video artist looking to make professional audio tracks and voiceovers for your videos, or whether you are a podcaster, coach or hypnotherapist wanting to make high quality recordings of your voice to sell or share. So let’s get a bit more detail on these 7 basic components of your first home recording studio. Your computer is going to be the central ‘hub’ of your recording studio. And although newcomers to home recording fret about the kind of computer they should purchase, if you are just starting out, then start with the computer you have got, and pick peripheral gear that will work on multiple platforms. Once you have got your basic studio together, and are ready to upgrade your computer then we can look at options in detail. But for now, pick an audio interface that will work on PC, Mac and iPad if you can and are not sure which direction your recording is going to take. If you bought a computer or iPad within the last 3 or 4 years it will be more than adequate for recording, mixing and sharing your audio tracks. An audio interface is probably the first really crucial hardware you will purchase when getting ready to create your first home recordings. This is the equipment that will get your recordings INTO your computer and will also connect to speakers or headphones so you can hear what you are doing. We have two really good guides to help you get started: one will explain exactly what is an audio interface if you haven’t come across this before, and then once you understand the basics, we have another post on how to choose the perfect recording interface for you depending on your specific requirements – and of course your budget! 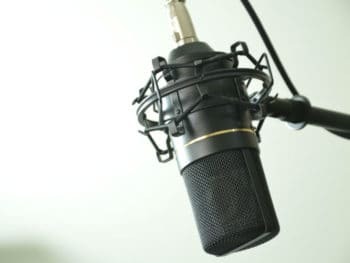 First of all, if you want to know all about different types of microphones, and what all those complicated spec sheets mean, then you can refer to our ultimate guide to recording studio microphones. Once you have invested in a mic, you have three basic options when it comes to using a microphone for recording on your computer or tablet. 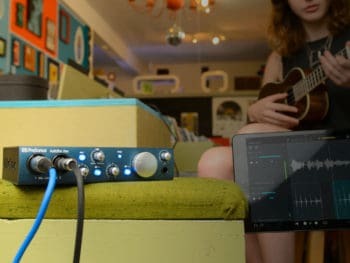 You can: connect direct to the external mic port on your computer; record through an audio interface; or purchase a USB microphone. For more details about these three options read our introductory post about how to connect your mic up to your computer. 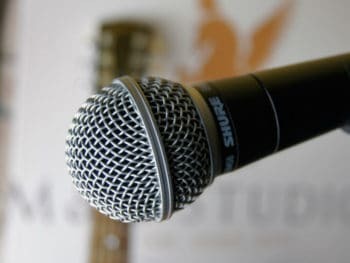 And if you have decided that the USB microphone route is the way to go then you might find it useful to read about how to choose the right USB mic for your own recording situation. If you want some more basic info, then we have a quick guide on what is a USB microphone too. Is a MIDI controller essential? Not if you are only planning to make straight audio recordings via a mic. But if you want to use virtual instruments (eg create drum, synth and bass tracks), create your own sheet music, or learn to play keyboard then even an entry level keyboard is a must. You can read more if you want us to help you decide if you need a keyboard. If you already own a digital piano or keyboard then you can easily connect it to your computer with a simple interface or USB lead, and save money. If you know you definitely want to buy a MIDI keyboard, then we have a comprehensive guide on how to choose the best MIDI Keyboard Controller which considers everything from number of keys to whether or not you should have additional faders, onboard sounds etc. Choice of software very much depends on what you want to achieve. If you are looking to do very straightforward recording and editing, then the easiest software to start out with is Audacity Recording Software which is free, and very easy to use when you are starting out. The other software to think about trying is Reaper, which you can use for free for 60 days and is very inexpensive to purchase if you like it. Reaper has full audio and MIDI capability, and is a fully fledged Digital Audio Workstation, whereas Audacity is best for simple audio recordings. Remember your audio interface, USB Mic or MIDI Controller may come equipped with an entry level DAW (Digital Audio Workstation Software), and if this is the case you will not need to buy any software straight away to start making your first recordings and compositions. So, the important thing is to get your hardware right first whatever you want to do. And you could also check out our post on music making software which looks at the different things you might want to do – for example making your own sheet music, or learning to play an instrument. Maybe you already know you want a flagship copy of Pro Tools, Sibelius, or Cubase. Fantastic! But whatever you want to do, make sure you have the right equipment or you might find the software does not work as well as it should. Once you have got the sound into your computer, you need to get it out again! It is no good creating your perfect first recording on your computer if you can’t hear it properly! So at least you will need to invest in some good quality studio headphones and if not straight away, you will also want a good pair of monitors (powered speakers). Studio monitors provide a neutral uncoloured sound so you can perfect your mix and judge it accurately. However, good monitors are not cheap, so if you are on a tight budget, maybe start by investing in headphones. 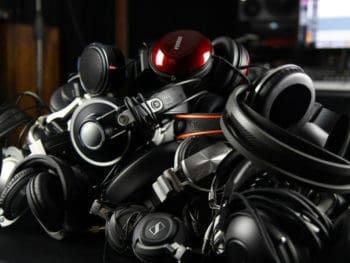 We have an introductory guide which examines which are the best studio headphones for different recording and mixing situations. 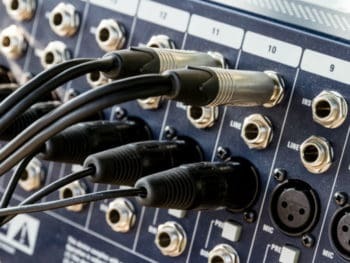 The key audio cable types you are going to need are a mic cable, to connect your microphone to your audio interface (unless you have decided to choose a USB microphone) and also the cables to connect your audio interface up to your studio monitors (unless for now you are going to use headphones. Also a mic stand is absolutely essential if you are using a microphone, it is not practical to attempt to record through a handheld mic on your computer and try and operate the software at the same time. USB mics often come with a stand. And you can get away with a sturdy desktop stand rather than a full floor standing boom stand. Just make sure you factor this in when purchasing your mic. If you cannot make your mind up on all the separates, then all the best brands do fantastic ‘studios in a box’ which contain microphone, audio interface and headphones, along with some recording software. Absolutely perfect for the complete beginner, because you know everything is going to work well together. Our favourites are below, and if you want to know more, read our full reviews of these all-in-one recording studio software and equipment packages. Aimed at musicians and producers seeking a portable high quality audio solution, this is a complete mobile hardware/software recording studio in a box that works on iPad, Mac and Windows. Contains interface, headphones and software plus the cables you need. Unbox and go! Digital Audio: A Complete Beginner’s Guide to Successful Digital Audio Recording – there are a few key things you really need to know about digital audio before you make your first recording. This article will help you avoid some of the most common pitfalls. 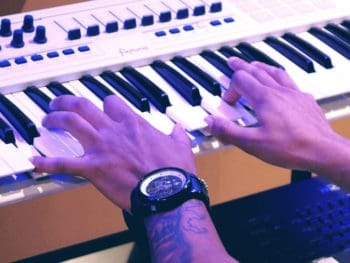 MIDI Connection | How to Connect a MIDI Keyboard to a Computer – whether you want to control virtual instruments in your DAW, or use any MIDI software, the first thing you need to do is get connected. This article tells you how. Hopefully the above list will have given you some idea of how to get started with your first home recording adventures. As well as helping you to make great recordings, we believe with a passion that if you want to learn a traditional instrument like piano or guitar you can learn so much faster if you make use of home music studio equipment. 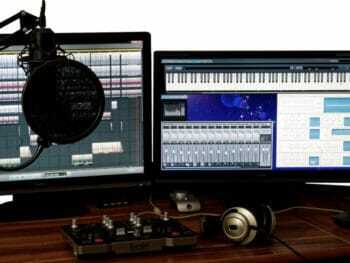 We have been helping people like you with home studio recording equipment and music software since 2003. And we want you to succeed. We give free no-frills advice and guidance, and share tips and tricks on home studio recording setup and music software to help you record, learn and create. You can read our step-by-step guides and tutorials on audio interfaces, MIDI keyboards, MIDI controllers, recording software, mics, guitar and DJ gear. 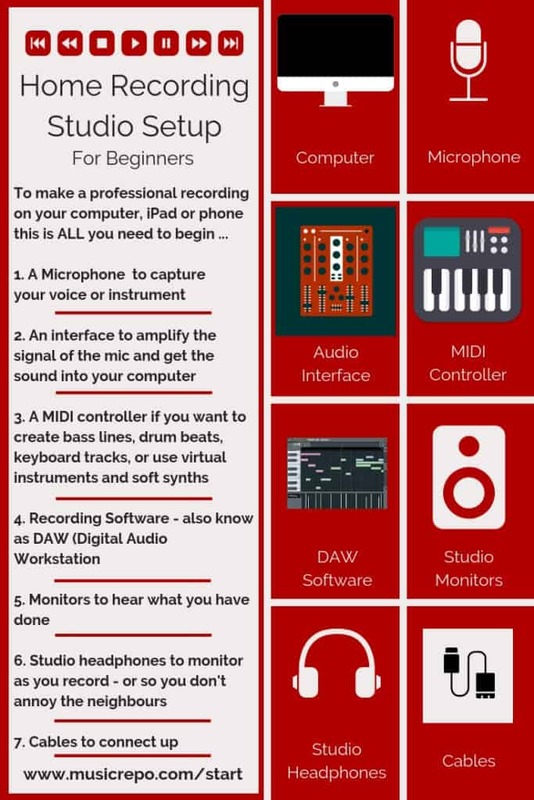 We are always working to build this into a comprehensive resource on getting started and helping you make music using technology. If you can’t find what you want here, then please contact us and we will do our best to add the information you need. We are famous for our friendly helpful advice and our outstanding customer service. We want you to make the right decisions, build your confidence and achieve more in your first home recording studio. 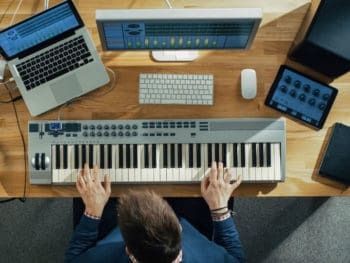 So whether you want to make music on your PC, Mac, iPad or laptop, use music software to DJ, Mix, or for composition, notation, accompaniment, or learn how to play piano or guitar better, we give sound advice on music software and how to select and setup your home studio recording equipment to achieve your goals. Once you have got your basic studio set up, then make sure you come back for more detailed information on how to get everything working and build up your experience. Pls, can I use sound card & audio interface at the same time while recording?